Passive Voice | What is Passive Voice? A verb is said to be in the passive voice when its subject does not perform the action of the verb. In fact, the action is performed on the subject. 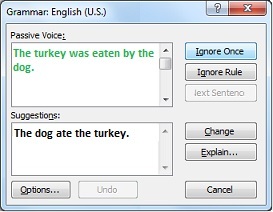 Passive voice is a quality of a verb that describes when the subject of a sentence is acted upon by the verb. When the opposite is true (i.e., the subject of the sentence is acting out the verb), it is said to be in active voice. To identify verbs in the passive voice, you must identify the subject and then determine that it is being acted upon. A knife was used to commit the murder. Step 1: Find the subject. Step 2: Did the subject perform the verb? The murderer used a knife. If a verb is in the passive voice, its subject has the action of the verb done to it. Everyone was startled by the power outage. A scream was heard coming from across the house. The candles were extinguished as we rushed to the scream. The crime was illuminated shortly by flashes of lightning. A trap was devised to catch the killer. Lieutenant Lavender was caught by the brilliant detective Educator Emerald. In a passive sentence, the person or thing carrying out the action (often called the agent) is introduced with by. The cows will be moved after tea by the farm-hands. The farm-hands will move the cows after tea. All the pies were eaten by Lee. Lee ate all the pies. The fishing rig was designed by Mark. Mark designed the fishing rig. The tin of tuna fish was opened by Sasha. Sasha opened the tin of tuna fish. The printer cartridge was replaced by the engineer. The engineer replaced the printer cartridge. Sometimes, to turn a passive sentence into an active one, you have to create your own subject. The crowbar was used to open the window. The burglar used a crowbar to open the window. Fish that are not popular in the restaurants are discarded. They discard the fish that are not popular in the restaurants. The map had been misplaced. Passive sentences and why they are useful What are verbs? What is the subject of a sentence? What is the object of a sentence? What is the active voice? What is an active sentence? What voice should I use?